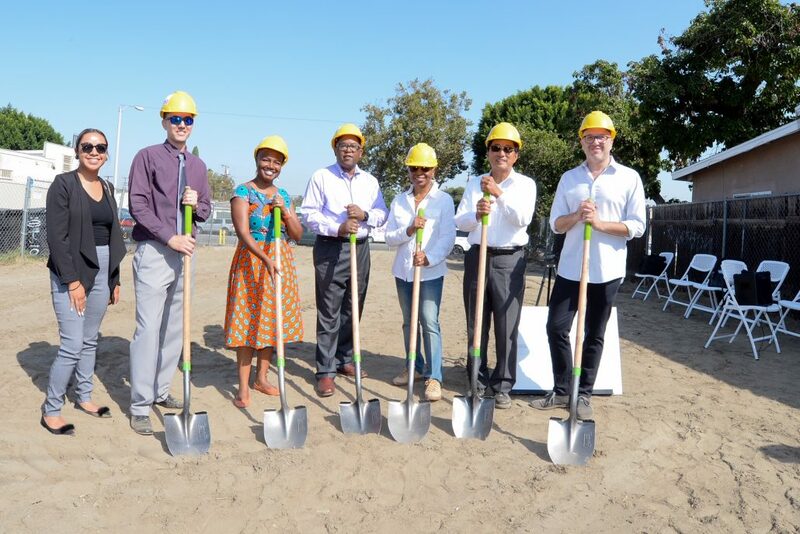 Officials from the Community Development Commission/Housing Authority of the County of Los Angeles (CDC/HACoLA) joined Los Angeles County Supervisor Mark Ridley-Thomas to celebrate the groundbreaking of the East Rancho Apartments. Located in the unincorporated area adjacent to Compton, the development will provide housing for 10 transition aged youth who are experiencing homelessness or who are at risk of homelessness. The CDC/HACoLA provided the land for the new construction to developers Special Service for Groups, Inc., and Restore Neighborhoods LA, Inc. The East Rancho Apartments will provide two-stories of stacked duplex housing with an attached parking garage. Each duplex will have five single-room occupancy units, and will include shared bathrooms, kitchen, and a living room. The residences will emphasize a supportive communal lifestyle and provide onsite clinical and supportive services. All residents will have access to a full range of case management, mental health, substance use disorder, education, and employment services to assist towards their goal of independent living.